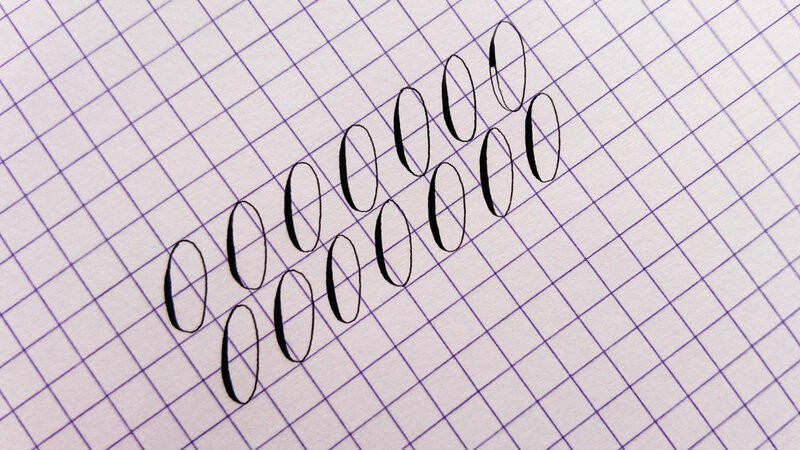 Bureau Direct, one of my favourite UK stationery suppliers, is offering an exclusive giveaway of my must-have calligraphy paper: Rhodia and Clairefontaine Triomphe. Enter to win via the widget at the end of this blog post, but, for now, find out why these papers are my go-to calligraphy paper choices for practice and digitising. A quick overview of Clairefontaine and Rhodia paper is that both have an exceptionally smooth finish which is perfect for calligraphy nibs and ink. With a little research for this post, I learned that, while they are two separate brands, Clairefontaine is the parent company and produces the paper for both. "The Rhodia pad... features superfine vellum Clairefontaine paper in white with an exceptionally smooth satin finish." There’s nothing quite like Rhodia paper for calligraphy practice. A high grade vellum paper, it’s by far the smoothest I’ve come across. If you were just looking at specs alone, the 80gsm weight of this paper belies its ability to heartily withstand just about any ink you want to splotch on it -- and the ink won’t bleed. I have always used the grid-style in A4 format. It doesn’t have Copperplate’s 54 degree angled guidelines and traditional 3:2:3 letter height ratio (it’s 1:1:1), but the ease with which the ink glides across it lets me focus on specific areas for creating calligraphy letter forms. Of course, you could opt for plain Rhodia paper and draw/print your own guidelines, but, for me, for practice purposes, the grid works out just fine. Rhodia Pad (no. 18) — £4.95 / pad (80 sheets) — plain, lined, grid and dot grid. 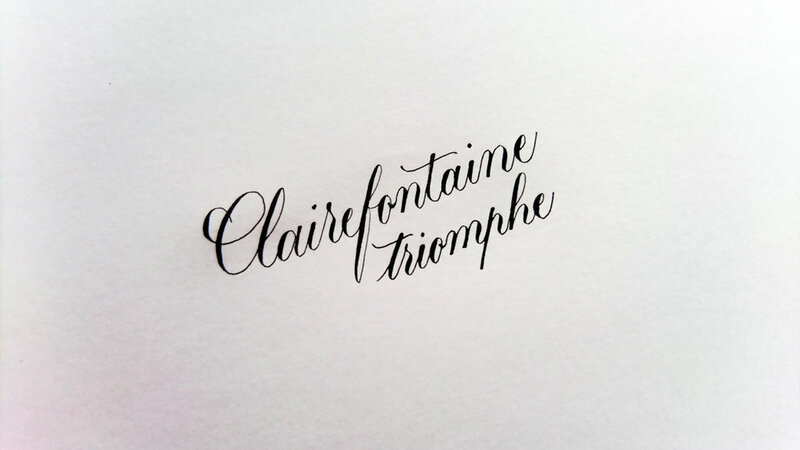 My go-to blank paper for writing calligraphy that I plan to digitise is now undisputedly Clairefontaine’s Triomphe. This 90gsm high white paper, like Rhodia, is exceptionally smooth and a dream under any calligraphy nib. When there’s so many factors that can influence whether your calligraphy ends up looking good or bad (apart from your own cruel self examination), I really appreciate having a foolproof paper to hand that will take any ink or nib I bring to it. While these papers — from high quality French stationery brands — aren’t the cheapest, I’ve always found them flawless and so reliable that I’m happy to spend the money (and, when you break it down, they work out to around £0.07 per sheet). I do use other, more economical paper choices when working solely on calligraphy layout, but I’ll save that for another blog post. If you’ve never given these papers a try, this is the perfect opportunity. If you're in the UK, Bureau Direct is kindly offering three Olive & Reid Studio readers the opportunity to win both. Submit your entries in the widget below. It will require you to sign in and then check off each step that you take to enter (e.g. if you tweet something, you need to indicate that you’ve done it in the widget — it’s not automatically detected). The winners details will be verified and passed to Bureau Direct to deliver the prizes. Watch this clip of me writing "Rhodia" on Rhodia to demonstrate the paper's delightfully smooth texture (at double speed).